A coil binding machine is a binding machine that uses coil as it’s primary source of material to bind professional documents, books or reports. Coil binding machines are commonly used in small offices for the sole use of producing informational packets or summaries. 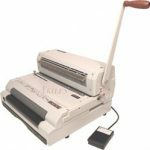 Lloyds of Indiana carries a large selection of coil binding machines from leading manufacturers like Akiles, Tamerica and Rhin-O-Tuff. We have machines for the occasional office user to the commercial brands for print shops doing volume projects for clients. You manually bind or automate the binding process. For coil, you need a punch machine and roller. The final process requires a crimp of the coil to keep it from running loose. Any questions, you can always call Lloyds of Indiana at 877-626-6848. There is always someone to answer the phone during normal business hours. Or, always go to www.lloydsofindiana.com for pricing and availability.